The Appalachian Long Distance Hikers Association began in 1983 as an off-trail family of fellow hikers and friends of the trail who've all shared similar experiences, hopes and dreams on the Appalachian Trail and other trails. Membership is open to all, regardless of whether you've hiked from Georgia to Maine, or just walked from your car to a trailhead. ALDHA is a nonprofit corporation registered in New Hampshire. Our mailing address is ALDHA, 10 Benning St., PMB 224, West Lebanon, N.H. 03784. Our email is aldha@aldha.org. Members get together each fall for the Gathering, where folks share their experiences through workshops and slides. In 2018, it will be in Pennsylvania at Shippensburg University Oct. 12-15. To find out more, please visit the Gathering page. In addition to the Gathering, ALDHA sponsors or cosponsors trail work trips that always include a post-Gatheirng expedition. The work trips provide long-distance hikers with a means of giving back to the trails they hike. Besides work weekends, ALDHA has taken an active role in trying to address other trail-related issues, including the issue of backpacker etiquette and the institution of new backpacker fees in Great Smoky Mountains National Park. 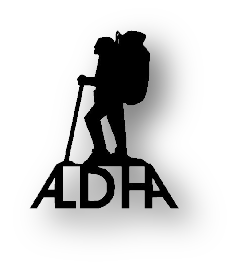 ALDHA publishes a quarterly newsletter, The Long Distance Hiker, with news and articles of interest to long-distance hikers. The group prints an annual Membership Directory with hundreds of hikers indexed by name, state and trail name. And it launched this home page on the Internet on National Trails Day in 1996. It's been a handy place to put things like information about the Gathering, digital copies of the newsletter, public notices, and links to The ALDHA Store and the A.T. Companion. Membership in ALDHA is open to anyone and costs $10 a year per family. The fall Gathering costs $20 per person. So registration & dues for the Gathering comes to $30 for an individual, $50 for couples. Use the online form elsewhere in this Web site to join ALDHA, renew your membership, or register for the Gathering. BIG THINGS often have small beginnings, and in ALDHA's case, it was very small indeed. On the weekend of March 5, 1983, a group of 18 people gathered at the trail hostel known as Highacre in Harpers Ferry, W.Va., and talked about the need for a new trail organization that would promote the welfare of the hiking community. "There was a lot of high energy that weekend," Albie Pokrob recalled. "It was a lot of fun." 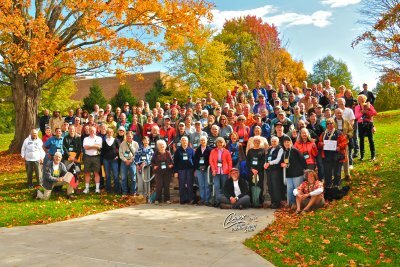 The meeting was convened by Warren Doyle after he held the first successful Gathering of long-distance hikers, dreamers and friends of the trail the previous autumn, at the Appalachian South Folklife Center in Pipestem, W.Va., and nearby Concord College in Athens. 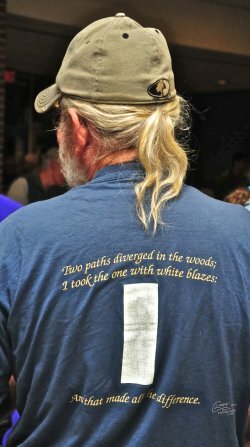 There were more than 200 people in attendance, giving Warren the impetus to keep the spirit of that first Gathering alive through a formal organization to represent the long-distance hiker. The group that met in Harpers Ferry in March 1983 held meetings during the day on Saturday and Sunday, and the first order of business was to come up with a name. Several ideas were bandied about, including "The 2,000-Miler Society," referring to the moniker often attached to hikers who complete the 2,000-mile-plus Appalachian Trail. But the group wanted something more inclusive, so it came up with the Appalachian Long Distance Hikers Association. Note the word "hikers." Some folks mistakenly use the word "hiking" in our title, but the emphasis was placed on the people on purpose. At one point during that March weekend, everybody gathered outside the headquarters of the Appalachian Trail Conference (now the Conservancy) for a group photo, and several other folks showed up to join in the picture-taking. The photo you see above is that shot, and it's now somewhat of a historic image. Besides Warren and Albie, it includes legendary ALDHA founders Ginger Bowes and Jean Cashin, Cindy Ross, Bonnie Shipe, Sam Waddle, Don Pelletier, Steve Markiewicz, Peter Montgomery and Violet MacPhee. 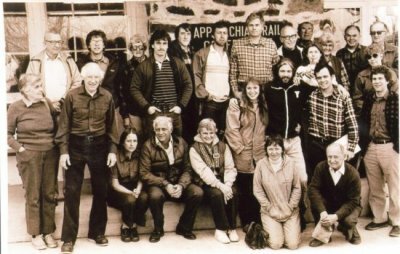 Of interest is that of the 25 people in the photo, four are now members of the Appalachian Trail Hall of Fame (Ed Garvey, Dave Richie, Dave Sherman and Ruth Blackburn) and two have been honored by the Hall of Fame for their service to the trail (Cashin and Thurston Griggs). There may be future Hall-of-Famers in that photo; we'll just have to see.